Have you ever wondered what it would be like to step into another mum’s shoes? Well, so have we. That’s why we’re asking mums to give us the lowdown on everything from their morning routines to must-have items and funniest sleep deprivation stories – starting with Lah-Lah singer Tina Harris. 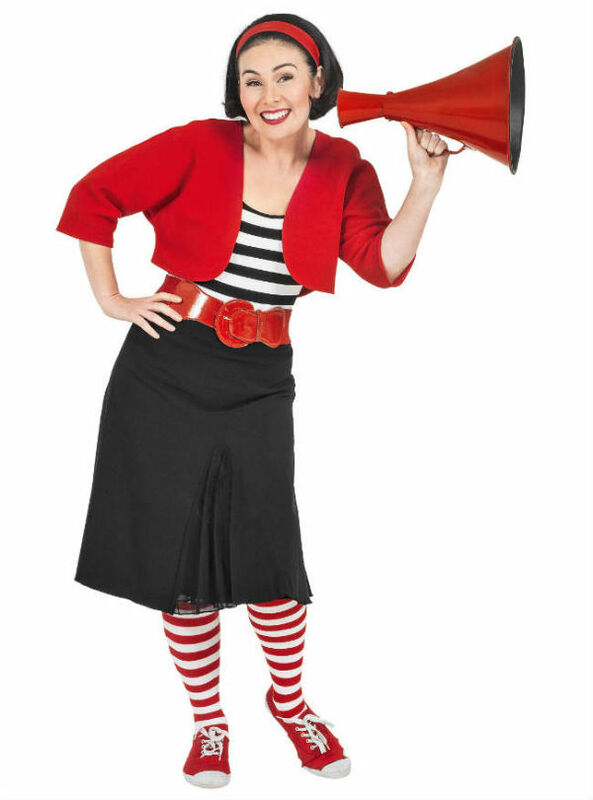 As alter-ego Lah-Lah, Tina fronts her live children’s band and stars in music video clips seen daily on ABC4Kids and Nick Jr. We’re also about to see a lot more of her in a new TV show hitting CBeebies next month. 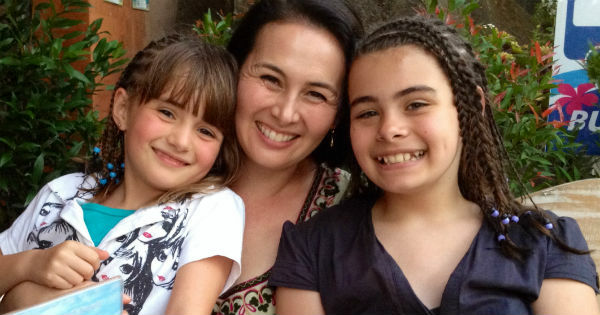 So how does the busy Sydney mum of Lily, 11, and Emily, eight, fit it all in? It actually never feels like a routine – it’s quite chaotic and I always say, “must get up earlier”, but that is so never going to happen. I usually wake up around 6.45am and meditate for 15 to 20 minutes (this is the “me” time and the only thing that keeps me sane). Then it’s breakfast, making school lunches, packing the car for a concert or a class depending on the day and trying to get Emily to brush her hair (Emily hates brushing her hair). We try to do kids’ music practice but it’s always a bit rushed. I do find I’m much faster after the second cup of coffee. What’s one thing you said you’d never do as a parent, but now do? Dessert, I never got dessert as a kid but somehow, my two just love it and really feel cheated if we don’t do dessert. I’m more a fruit kind of person than ice cream. And yes, I do have a bit of mummy guilt about it; (husband) Mark doesn’t, he’s perfectly fine with it. What do you wish you’d been told before having kids? Oh nothing really, it’s all a big fun adventure. Every stage of development has its own rewards and challenges but that’s what makes it interesting. I just love watching the girls get older. I do miss the baby stage. They were both so gorgeous but now I can see them blossoming, becoming more independent, and it’s a privilege to be their mum. What’s the best advice you were given about having kids? A friend of mine said, “there will be days when you just need to put the kettle on”. She was so right – you can try and try and try to do everything and be everything to everyone but sometimes you just need to let go, go easy on yourself and have a cuppa. Is your parenting style similar to that of your parents? What do you differently? What do you do the same? We have similar values, but I was an only child so I had a much different kind of upbringing. My parents ran dress shops so I grew up in the shops. My girls have a very different kind of life and they have each other. I love that they are best friends (on most days). One thing I do do the same as my parents is pets. Dad always let me have a lot of pets (horse, rabbits, goat, dog, turtle, etcetera – we did live on a farm). I can’t help it, I have a habit of coming home with pets. We’ve had rabbits, dog, cat, chickens… a bit of a zoo. Oh, hard question and one I’m only just getting a handle on. Meditation has changed my life and the way I look at things. It’s so important to have some “me” time and I think as mums we often don’t allow ourselves this little luxury. That 20 minutes in the morning can sustain and recharge my entire day. It really is my sanity and if I miss a day, I really do notice it. I wish my answer was exercise… that’s on my to-do list. How do you keep your adult relationships and social life going? Mark and I work together, live together and play together. We spend far too much time together – in fact considering this, we really shouldn’t be together, but it works and I am so grateful. We have a wonderful group of friends and I always try to catch up with other mums on Monday morning for a quick coffee. I’m terrible at going out, I’d much rather stay at home, but as the girls are getting older they enjoy eating out and spending time out so that’s fun. What is your best parenting moment so far? Golly, it was last week. Lily decided she would do some fundraising at school and advertised, bought and then sold 164 ice blocks and raised a little over $200 for animal welfare. I was amazed by her drive and gumption to follow through on a very cool idea. I think our recent trip overseas opened her eyes. She saw people with not very much, going out there and making opportunities. She also learnt about paying it forward. This made me super proud. Oh gosh we’re all human – sometimes if I’m too tired and I have a short temper… well, that’s always the worst parenting moment, isn’t it? What’s the funniest thing you’ve done when sleep-deprived? Don’t remember – I was sleep-deprived. What parenting super power would you most like to have? Can I fly? I’d like to fly, that would be fun… or to be just a little bit magic. What has surprised you most about parenthood? Parenthood is the best, parenthood changes your centre and refocuses your life. I love sharing my life with my family. But there really is far too much washing! How do you spend time with your family? We cook, we sing, we talk, we eat, we just try to do stuff. The time is the big thing, it doesn’t matter what you do so long as you take the time to do it. What’s the one thing in your home you wouldn’t be without? Paw paw cream. That stuff is amazing and you can seriously use it on any part of the body. I guarantee one of my kids has rubbed it into their lips or smoothed over a scratch already today. If you had more time in your life, what would you like to do for your kids? Travelling, I just love travelling and so do they. Family. We have an awesome family and they are always there whenever we need them (which seems to be all the time), from renovating to moving to babysitting. Grandparents rock! Lah-Lah’s Adventures the TV series begins on CBeebies on September 1, and you can see Lah-Lah’s music video clips daily on ABC4kids and Nick Jr. Look out for The Secret Lives of Mums column each week. We’d love to hear your story – if you or someone you know would like to be featured, please fill in the General Enquiries form on our contacts page with the subject line “Secret Lives of Mums”.